Christmas Music Lyrics and Piano Chords for "Entre le Boeuf"
Christmas music lyrics and piano chords for "Entre le Boeuf," now with a BEGINNER arrangement. This very pretty old French carol has a new English translation, plus a handy pronunciation guide to the French lyrics to QUICKLY get you and your students up to speed! You've heard this beautiful carol before - now you can sing or play it too, with NEW English Christmas carol lyrics that make use of the musical rhythm to stress the words correctly. 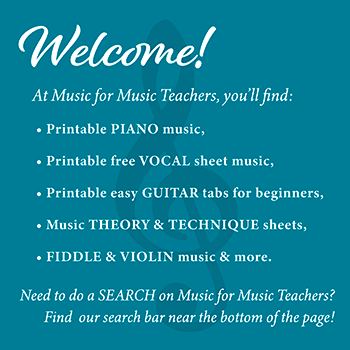 Download lead sheets or several piano versions. This arrangement is for young students who are familiar with reading melodies using both hands, around Middle C.
I have found that my young students are very open to taking home one or two new easy songs like this every week, if I help them write the first few notes on the sheet. We treat it like a note-reading exercise, and they know they are expected to finish writing the notes on the sheet at home, making use of a note-reading guide if they need it. I have read that Entre le bœuf et l'âne gris" (from the 13th century) is the oldest French carol that is still sung today. There are two main variations on the melody, some adding extra beats, which you can hear in a few of the arrangements available on Youtube. My French is "developing," however, the words of this song are pretty straightforward. I have written a translation that is mostly new and seeks to preserve the real meaning of the French words, while placing stress on the important beats of each measure. I had looked at a lot of English translations and decided none of them were good enough, for those who actually wish to sing in English! The lyrics for this Christmas piano sheet music are so simple, but transcendent at the same time. Here is the God who cannot be contained by all of the heavens, voluntarily entering TIME and SPACE and becoming one of us, a union of deity and humanity that is beyond understanding. And here in this song, He is a baby, sleeping between farm animals, sleeping between Mary's two arms. "Mille anges divin, mille seraphin" means "Thousands of angels divine, thousands of seraphim..."
Download pronunciation for English speakers, to the French lyrics of "Entre le boeuf"
Thank you so much for this website, I have found just about everything that I need in music. Do you have a story or even a question about this vocal piece? Share it!